The LIMBO game is the hit of any party. The game features a tropical theme painted backdrop, a tape full of "Limbo" music, and an authentic bamboo pole with adjustable settings. 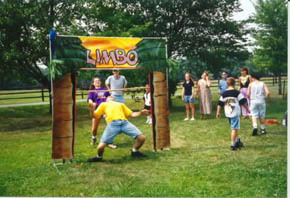 Whether it's a wedding reception, an office party, or a neighborhood block party, the LIMBO game will liven up any event you've got going. Plus this compact, low maintenance, low cost product will really boost your profit potential. The game can be set up in less than five minutes and can be used indoors and out.